Rewires by NIC EIC Registered Electricians in Torbay and South Devon. As building regulations change and electrical systems in properties get older and outdated there comes a time when for legal or safety reasons a rewire of the property is needed. Rewire or Rewiring is the general term used when upgrading and replacing of the wiring, switches, sockets and fuseboard in your property. 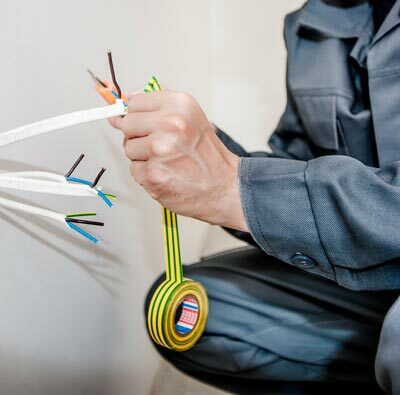 As electrical regulations change and existing wiring becomes outdated or damaged, there comes a time when a rewire is required. During the rewire the old electrical cables are removed from the property and new cables are pulled through. At the same time a new consumer unit (fuse box) is fitted if needed. Once new switches, sockets and fittings have been connected to the new wires, you are left with new wiring that meets the current regulations. A rewire is also the perfect time to improve any areas of the existing electrics that you are not happy with. Many people choose to make a list of any improvements that you feel could be made, common examples include adding additional power sockets to prevent overloading sockets with multi plugs or adding extra lighting to ensure that all rooms are well lit. It is also here where you can list any features you have seen and liked in your friends or families homes such as LED lamps or outside security lighting. All of these ideas could be perfectly implemented at the same time as your rewire. When we visit a customer’s property we love to hear any new ideas that they may have. We are also more than happy to provide our own professional opinion as well as any ideas that we feel could be a benefit to the customer in helping them achieve a much improved living space. At Finish Electrical we understand that any work inside a customers property can cause disruption and disturbance to the occupiers. We undertake all our work in a manner that ensures that all disruption is kept to a bare minimum. During a rewire we ensure that each night when we leave the property that the customer is left with a fully functioning safe electrical supply. At no point during the rewire will you be left without power in your home. We also ensure that the rewire is carried out with as little disturbance to the decor of your property. On occasions we do need to disrupt walls or floors to gain access to run the new cables. However when this is required we make sure that only the bare minimum of disturbance is caused. Many people have visions of their property needing extensive redecoration after a rewire has been performed, this is not normally the case. If you require more information then please contact us where we will be more than happy to arrange to visit your property to be able to explain in detail what will be required for your particular rewire.